When the crowds gather at gaming conventions, FFXIV never fails to deliver exciting news. During the PAX East event, Naoki Yoshida (producer/director of FFXIV), Christopher Koji-Fox (Lore Dev), and Matt Hilton (community manager) answered player questions while teasing many new content features. Some feature’s blew away expectations such as the Deep Dungeon, with randomly generated endless floors. Other’s included previously mentioned content, but with a few more details such as the Treasure Map Dungeons and additional teases about what will be discussed at next weeks Live-Letter! Read more to find all the exciting details! Endless Dungeon – Exactly as it sounds, sort of. In one way it’s endless because its very likely most players will never make it to the final floors, and if they do, they will simply add more. Supposedly, there will be hundreds of floors to start with. As players progress, they will encounter bosses along the way who also increase in difficulty and level! Solo or 4 man – Hurray for more challenging solo content! But if you are afraid of going it solo, you can still go with a group! Random Generation – You heard that correctly. The maps are randomly generated, and so are their duties, tasks and monsters. Not only will you never see the same scene twice, but you’ll also never know what tasks or enemies are coming up next! Content for All Players – Anyone can do this content, because its all about how far you want to go! Your progress is saved throughout your attempts so you can start off at the nearest (rounding down of course) 10th level of the dungeon that you have completed so players are kept doing the content appropriate for their skill level. You Start Naked – Ok not literally naked, but you do start at level 1 with basically no gear, skills. Your current item level in game will mean nothing. You must work your way through the dungeon only with items earned in the dungeons. This is also great news as its content that veterans can start doing with new friends that join the game right away! Lastly, if you want variety, the progress is saved for each job independently! Random Handicaps and Buffs – Are you a fan of Final Fantasy VII’s Battle Arena in the Golden Saucer? Do you remember the handicap reals? Similar to that, there will be floors and rooms where all your abilities might be disabled, or just magic, and perhaps a myriad of other things like the ability to see where you are going or gaining friendly NPCs. 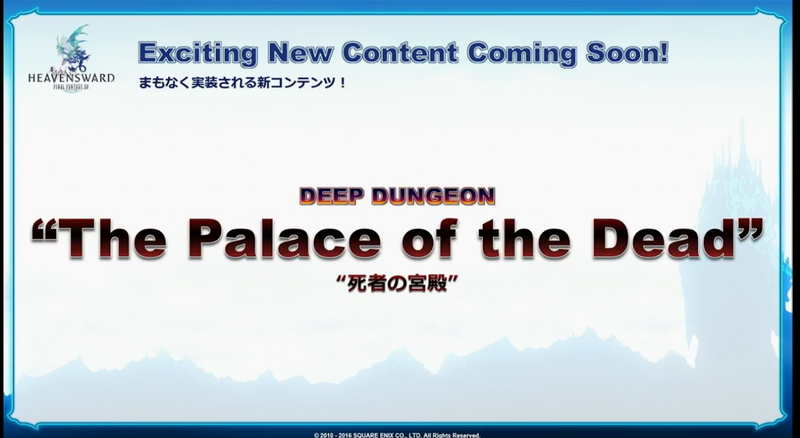 Palace of the Dead – Is the name of the Deep Dungeon being released in patch 3.25. This indicates that there may be MORE endless dungeon types coming out in the future, and the Palace of the Dead merely the pilot of more to come! Treasure Map Dungeons in patch 3.3! Maps lead to treasure. Treasure leads to portals. Portals lead to the inside – of dungeons. These were announced a couple weeks back during Yoshida’s last interview, and reiterated at PAX East. These dungeons are treated as if they are a drop from Treasure Maps that Disciples of the Land can acquire and share with their friends. The difficulty doesn’t sound like they will be too hard and we all of course wonder what kinds of awards will be given. Access your FC chat, linkshells, and retainers ! Players can chat with members in your Free Company, link-shells, friends list, be they in-game or offline, and they can chat with you! You can access your retainers and the market board. There is lot’s of potential to help with retainer ventures. Here’s hoping I can get alerts for when things sell or when something on my wishlist is put on auction! Prior features such as links to the FFXIV database, forums, and Mogstation should be implemented as well. The world of Hydaelyn at your fingertips! Final Fantasy is known for harboring large and intense stories with much to learn about the entire world. However, just like a long book series, at is easy to get lost in a MMORPG story-line as you wait for the next set of stories to be released. This book, which will contain over 300 pages, is designed for the lore fanatic and casual story reader alike. Only 10% of the information will be directly tied to main story-line features due to plenty of ingame exposure. The other 90% will be jam packed with details of the world, the Twelve, the various prophecies and people, and everything else there is to know about the world. Also its not bad that the book itself will feel as if its a historical document with many sketches, concept art, and writing as if its from an ancient historian. Look forward to it! Hildabrand Quests will be released every patch, and will have much more content than the one released in patch 3.2. Chocobo’s out in dungeon queues! Allowing chocobos to be summoned while queued for dungeons is at the top of the Quality of Life changes they are working on at the moment. 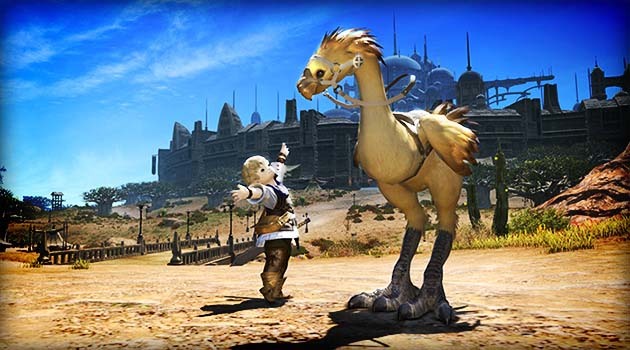 They also want the ability to be able to summon chocobos in a variety of dungeons for current and future tasks. Yoshida loved the idea of creating F.A.T.E.S. and other group content for Disciples of Hand and Land, but nothing definitive was mentioned. They are releasing summoner pet glamours every update. The first one will be carbuncle glamours! I miss my carbs! 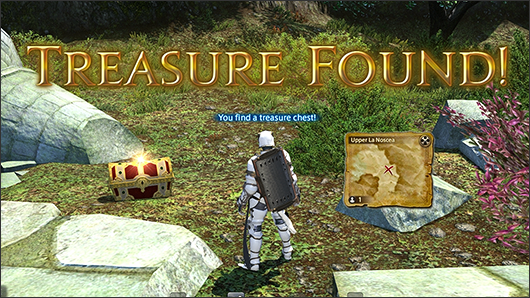 Both the 7-11 promo items and crossover events for Phantasy Star Online 2 will be coming to all players of FFXIV. Yoshida wants players to mention on the forums (under a single thread) which glamour items they want to be offered to both sexes. Unlocking all gender specific items is a top priority for the team to help support cross gender fashion capabilities, but they have to prioritize the order they are completed. The top requested item so far is the bunny outfit from the golden saucer. New Jobs will be discussed during the FFXIV Fan Festivals. Yoshida “hated” the hidden moogle quests too, and plans to have a King Moogle Mog fight soon where players can take their revenge on these cute and cuddly fluff’s of pain. Though it felt they could keep going, the hour did have to come to an end. The details of patch 3.3 and beyond will be coming during the next Final Fantasy XIV Letter from the Producer Live XXIX on April 29th at 12 am (PST). 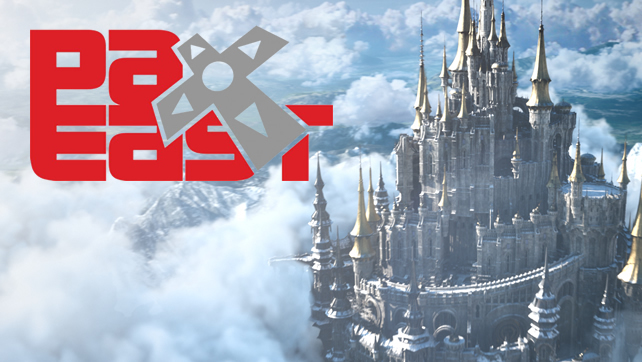 All of this information was shared during the FFXIV panel at PAX Prime East. You can check out this event’s recording and stay up to date on other live events with FFXIV at their official FFXIV Twitch Channel. Thanks for reading, and I’ll see you all in-game!